We are continuing to school through the summer as long as we can. We will be having a hiatus soon that may last a few months, so I wanted the kids to get a head start on the material for the upcoming school year so that they won’t fall behind. I did have a big pre-requisite for continuing though. We would only do fun school. Nothing boring. Only things that we really enjoy. Because it is summer after all. 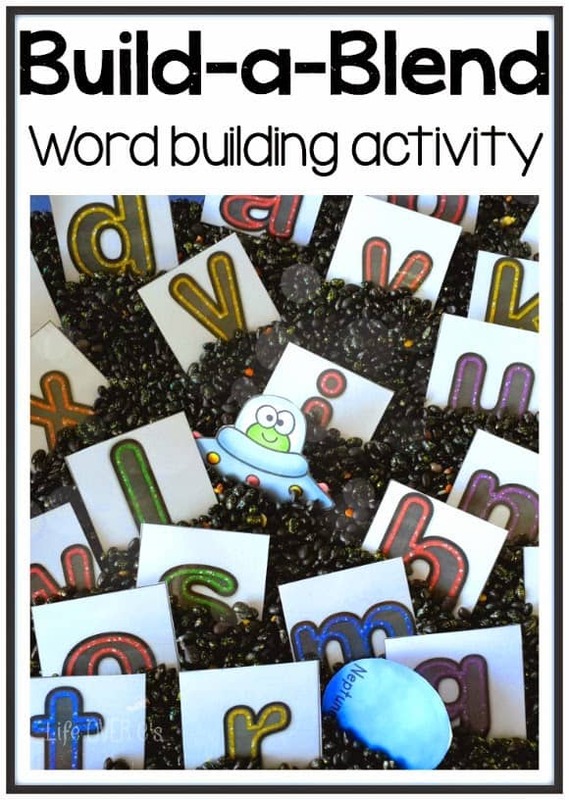 This word building activity that we did in our solar system sensory bin is just that. A lot of fun! It was so much fun for my first grader that her little and big sisters were begging to get in on the action. That’s a good judgement of fun! Sensory bins have been a weekly addition to our learning for several months now. Anytime I see that my first grader is getting bored with school (like every five minutes…) I pull out an interactive learning activity for her. She is still very hesitant to read in books, so I’m working hard to create and provide her activities that will help her build her confidence and desire to read. We’ve been playing our solar system sensory bin for a couple days now and I thought that the glitter letters would be a perfect complement to the glitter space rocks. This activity is incredibly simple to put together. Simply print on card stock and/or laminate for durability. I laminate everything that needs to last more than 2 seconds. You may opt not to do that. You will need two copies of the letters or you can eliminate the words that have two identical letters. In the bin above there is only one set of letters because we were not working with the double-letter words. Cut out your picture/word cards and let the student choose a card. Then, have them find the correct letters to build the word on the card. While this may seem to simple, because they really just need to copy the word, it is very beneficial in getting the student to look closely at the word, relate it to the sound they know relate to the picture and stretch the word for a clearer understanding of the phonetics involved. 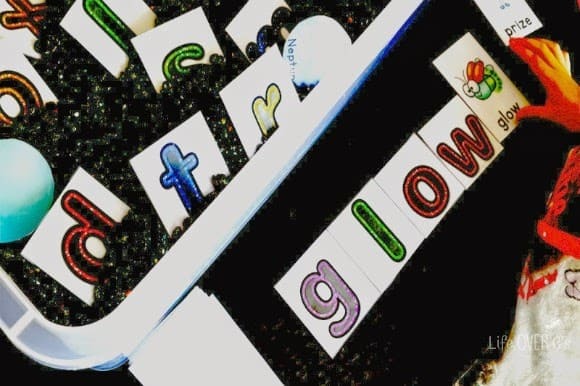 It also reinforces letter recognition which all primary students need from time to time. You can check out Jaida spelling one of her words here. She was having a blast and felt so confident! I totally love how Shiloh jumped into the conversation while Jaida was looking for the letter “e” (which, incidentally, Shiloh had hidden under the bin, thus the break in the video!) She has absolutely no idea what the letter ‘e’ is, but it’s her favorite letter say anytime that she sees letters. It was just perfect timing! When we are using sensory bins for school time we set clear boundaries. She can’t ‘just’ play. She needs to complete the activity all the way. And no tossing the sensory materials all over the place! During play time our big rule is that if you make a mess, you clean it up. Give this a try and tell me how you like it! Get the FREE solar system printables that you see in this sensory bin here. Hi, Kim, I am so amazed by your arts and clear and precise designs of all the materials you made for your homeschooling and yet you are so generously share all this educational tools with people, I can’t say thanks enough, I am now a hand-free mother, as my son is already grown up, however, I lately am a Sunday School teacher and am very much interested in teaching toddlers and preschoolers how to start to learn and prepare to go to school, and I happen to come to your blogs through Pinterest, and your blog is so packed with wonderful and beautiful tools and lots of varieties. I am in love your graphics and I am sure kids will love to learn with your designs and I am sure they will learn fast. Thanks again.